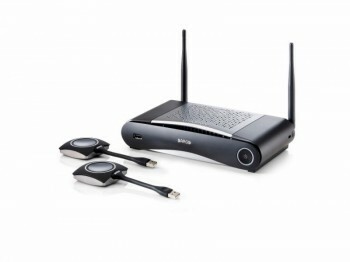 The Barco ClickShare CSE-200 is the new standalone wireless presentation system designed for small to medium sized meeting rooms and huddle rooms. For enterprise rollouts which require enhanced security features or central management, the new ClickShare CSE-2oo from Barco delivers full HD quality presentation sharing and includes two buttons for dual instant sharing. The Barco ClickShare wireless presentation system allows users to simply share what is on their laptop or mobile device straight to the meeting room presentation screen in HD quality, with no cables, no setup and no waiting to join. Anyone, including guests, can connect right away via a simple plug & play USB ClickShare button.